My Son picks up My bow and begins to draw the bow across this beautiful instrument. The strings vibrate as he runs the rosined bow across them. “I play the violin, I love violin.” He says. Already at two, He sees and the beauty of this instrument. The same beauty I saw many years ago. I remember the first time I heard the violin. I was Noah’s age. I remember thinking how beautiful it was. How it sounded like a human voice. I said I wanted to play it too. My parents said I had to wait tell I could reach my hand over the scroll. That I was to little. At three, almost four years of age, my hand could finally reach around the tiny child’s violin. I was excited to play it! I see the same enthusiasm My Son had. When I got older, I needed a full size violin. As luck would have it, the lady that babysat us (Aunt Gi-Gi) had a old violin. It was her Uncles and in need of some work. It was beautiful and old. (Aunt Gi-Gi would be well into her 90s by now.) She told us it had been sitting in her daughters basement. That no one in her family played the violin, so it hadn’t been used for many years. It looked like it had been played everyday. There was a crack that needed repaired and the pegs were worn. The varnish rubbed off in areas. Once fixed, it had a refined tone that violins only get from playing them for a century or more. This violin speaks and it has a story to tell just like its owners. I didn’t want to take it with me when we moved into the apartment because it would annoy the neighbors and because working did not allow me to play. I was diagnosed with a vestibular disorder in October. I am not able to work because my disorder gets worse with stress, and heavy lifting. I have many bad days, and very rare is a day when I do not have neck pain or a throbbing migraine, coupled with dizziness, weakness, and the inability to see properly. Until I begin therapy, the doctor said my condition will get worse. Even then my condition will get worse. Therapy just teaches you to compensate. So one day, I dusted off my trusty violin when Noah asked me about it. He wanted to take it with us, so I got a mute and it came home with me. I started to to play every day again, because Noah insists I play every morning. Something miraculous began to happen. My neck felt better, the migraines were not as frequent, making the dizziness more tolerable. The violin was working out the nerves that were giving me problems. I found out that music is the best therapy. Then I thought, why did I ever stop doing what I loved? When I wanted to go into music I was told it simply wouldn’t pay the bills. So I did something that would. Now I can’t do that because of my disorder. So was it really worth it? Sacrificing what I love to make more money? I wish I would have listened to my heart. Just like my Son listens to his. I see him with so much enthusiasm and I see the same enthusiasm I had. Nothing seemed to be impossible for him. This is how we achieve success. We decide not to give up. My Son has taught me two things. Never give up, and if you fail, get back up again an try… Keep trying and try again. So just like when he is learning to play the violin, I must not give up hope and get back up again. Then something clicks and I finally get what music means to me. It is the reason I am here. It is the whole reason Noah was here. If it wasn’t for music, if it wasn’t for the violin, he would have never existed. Music is what binds our family together. As fate would have it, it is also the reason I am here. My parents met at church. My Dad was playing the organ, and my Mom was filling in for the choir director. She had just had her appendix out and had trouble getting up to direct the choir. My Dad helped her stand up so she could conduct. They went to Friendly’s afterwords and talked until they closed. A few weeks later they were engaged to married. Then a few years later I was born, and my Brother followed two years later. Mike and I met at work. We exchanged books as well as stories for several week before we finally decided to go out with each other. We talked until closing time at the Winking Lizard. Our mutual love of music strengthened our bond. We listened to Mozart and other classical composers into the wee hours of the morning. We also went to a friends house, and they had a guitar. Mike began playing and I began to harmonize. Shortly there after, I showed him my trusty old violin. I played it for him. Some classical tunes and fiddle tunes alike. We were music nerds. A perfect fit for each other! Noah hears the same music his Grandparents heard. The same music his Parents heard. He hears the story it has to tell. The magic and alchemy of music itself. Musicians are like alchemists. Putting the elements together to create a beautiful healing piece of music. When these elements are put together and played to express emotion of great depth, they can be enough to move an audience to tears because of the beauty or, they can heal a person’s pain and sorrow. I have a theory on why this happens. The universe according to string theory, subatomic particles do not exist. The universe is made up of strings that vibrate. As Noah draws the bow across the string I begin to wonder if this is why music has healing properties. 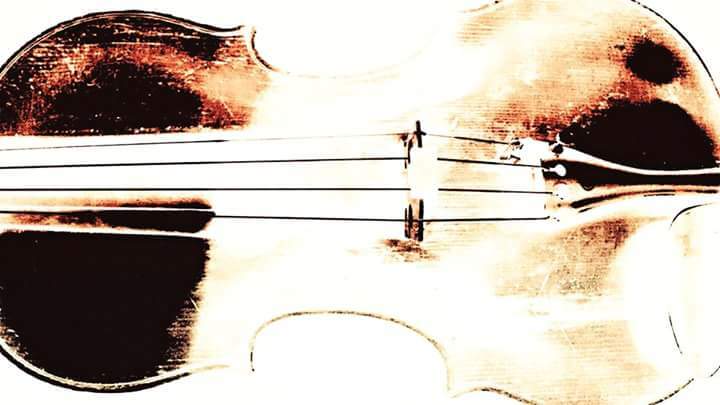 Can it possibly allow the strings that our body is made out of vibrate, and therefore make us feel with every fiber of our being, the music we are playing or hearing? Quite possibly could it allow those strings to vibrate differently and heal us in ways that science has to discover? I believe so. This is the Magic of music we have yet to discover. We have already discovered so much. As I teach my Son to play and he draws the bow across the string, I now realize the alchemy of music. That it truly has healing properties. That Noah feels the same properties I felt years ago. That he feels the love, sorrow, pain and joy, that has flowed through the violin as he draws the bow across the strings. Music is what holds us together by many strings. We never really choose music or to play and instrument. It chooses us. At the lowest point of our lives, it reminds us of how it strings us together, and it gives us hope. The hope I had so many years ago. The complete and utter joy of the alchemy of music.